Thank You ! I just asked a question on one of your other posts , looking for this exact info. Daughter is excited to get started, love this new blog. Hi Kristina!!! How are you?? It’s been a LONG time! I just found your new nail blog and I LOVE it! 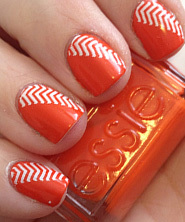 I’ve been stamping my nails for awhile now… so fun! But… Do you have any tips on stamping your thumb? I can’t get the whole stamp on my thumb (or big toe) and i don’t know of a good way to match up the stamps. You are amazing. Even though my nails don’t grow very long, I’d like them to look nice. You’ve given me hope! Hi Kristina. I’ve been a big fan of your card making blog for say three years now (!!!) 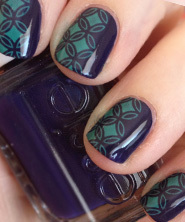 I just discovered your new nail painting/stamping blog and have to say – love it! Thanks so much for the great tutorial – you’re awesome! I’ve been following your papercrafting blog for several years now, and recently found this one. I’ve tried the nail stamping a couple of times now, most recently with the Sally Hansen Insta-Dri in 230 Silver Sweep over a deep purple metallic. 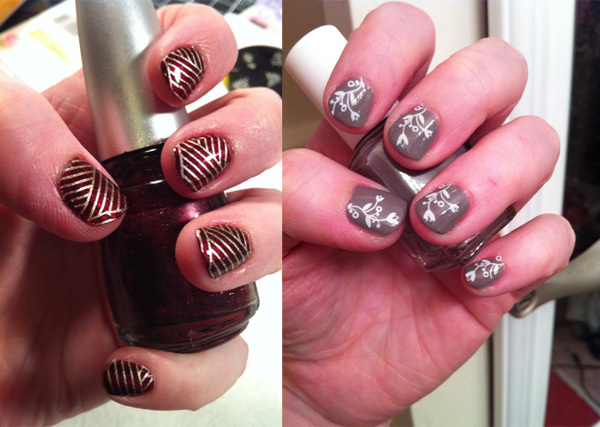 It looked great until I put the Seche Vite top coat on…then the purple “bled” through on top of the silver. Did I do something wrong? I have noticed that with silver stamping in particular that sometimes the base color comes through. For example, I stamped Silver Sweet over green polish and then the silver looked more gold and yellow than silver. You might try a different topcoat. Or perhaps maybe waiting a little bit longer before applying the topcoat? What about a layer of clear or topcoat before stamping the silver…then the final topcoat? fyi – not really. i use one-two q-tips, and only enough polish for each nail that i’d already be using. wow! I came over here after listening to PRT, and have now spent too much time discovering this! I’ve GOT to try it. I love to stamp, so it shouldn’t be that hard, right? f.y.i. I called Sally’s and they do have a nail stamping kit for $10. I did a little research on it, and it looks like it would be a good deal for experimenting, from what others have posted online, they include konad plates in the kit. Hi! Great video! I’ve been wondering about stamping for so long and this was so helpful! I did have one question though about the paper on the back of the plates. With all the use of the polish remover and multiple uses (of possibly different colors!) does that paper wear out or get crappy after a while or has it held up pretty well? Mine seems to be fine. The paper is coated so it doesn’t absorbs the polish or remover. do you remove the paper backing from the new nail plates? No, the paper backing makes the plates less sharp on the edges. You only want to remove the plastic film on the top of the plate. I just got a bunch of stamping stuff yesterday for my birthday (ooooh Happy Birthday to me!!!) and I LOOOVED it!! Thank you so much for the tutorial. I did have trouble with a few of the designs, though. It seemed like the designs with more details wouldn’t transfer to my stamp, like on plate M63, the only design that transfers is the houndstooth design, and I’m having a hard time getting the Zebra and cross hatch from M57. Any suggestions? PS – I’m so glad that my sister, Kelly (your long ago roomate) clued me in on your blog and thus stamping. Seriously so cute!!! Try using a credit card or old gift card as a scraper instead of the Konad scraper. Maybe that will help? Also, be sure to use 100% acetone remover to clean the stamper, scraper, and plate. If you use a remover with moisturizers in it, it won’t work. Hope that helps! Can you stamp over Gelish Nails? Hi, I just love this. It looks sooo cute! I have bought two different stamping sets and they don’t work. They just won’t transfer from the metal plate to the rubber stamp? Any advice? What brand do you recommend? I have a question about which nail polish you recomend for stamping? Most of the polish I have is sally hansen, and its really thin polish. When I stamp with it I get very light transparent images that aren’t true in colour….any recommendations? Check out my post about non-Konad nail polishes that working with stamping. Love your video! I get my nails done at a salon & do the gel polish. 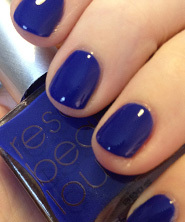 I was wondering if I could do this after I get my gel polish nails, will it still work? Yes. Just use an acetone-free polish remover to remove it later. Thanks for the video! I’ve been wanting to try this and you make it seem simple! Just one question though…how do you make sure the stamp is turned in the right direction when stamping so all your nails are uniform? Especially when changing the stamper from one hand to the other? I’ve just bought a plate and had a go after seeing your video (using pearl black polish from konad) but when i put the top coat on the black streaked – any tips for where I went wrong? It has to be completely dry. I am trying to find the Konad BM 201 plate, and can not figure out where to buy it, any suggestions? Really helpful tips, especially using Q-tips and the credit card as a scraper! (I was disappointed my plates were getting scratched!) The Q-tip really cleans the plate so much better than cotton pads/balls that I was using, and causes less mess to your hands / manicure. Also really glad I discovered that Sally Hansen Insta-Dry polishes (the ones with a sticker on top in particular) work great as stamping polishes! Good to have something that is more readily available than Konad. Bought everything needed & was excited to start stamping. Guess my big mistake was to sit in the garage with the wind blowing. Just couldn’t get this to work for me. Looked so easy & i waisted half a day trying. Guess i will need to stay inside next time i try?? I just started stamping this week and I’m finding that the image does not cover my entire nail. Do I just have unusually large nails? The only nail that is completely covered by the image is my pinky. 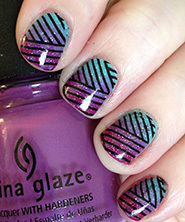 Your video shows the image covering your nail completely with a lot going over onto your skin. I wonder if my images are smaller than normal. I bought a kit at Sally’s Beauty Supply and it’s by Salon Express that came with a few plates. Most likely the images are smaller. I sometimes have trouble getting the image to cover my thumbnails, though. The rest of the nails aren’t too big. What gold stmaping color did you use? hi – i stamp with gold a lot and use two polishes: the sally hansen complete manicure polish in “gilty pleasures” and another SH Insta Dry gold. they both work great. What do you think I’m doing wrong? I thought maybe my nail polish remover is the problem.. I’ve cleaned my stamper with that.. have i ruined it? Hope you answer back, when I see you do it, it just looks sooo easy! Great video! I had not even heard of this before. I don’t really paint my nails but I still find it interesting.